Deborah Martin is a graduate of Coach University and a Coach University Professional Mentor Coach. Deb holds a Bachelor's Degree in Business Education and a Master's Degree in Career and Technical Education. In March 1996, Deb began her business, Portage. She has attracted an international clientele of leaders, high achievers, entrepreneurs, coaches and visionaries. Deb is extraordinarily intuitive and passionate about all things wild. She spends as much time as possible getting to know herself better and testing her limits in the wilderness. She gives Mother Nature credit for being her first coach. Deb's style is to guide clients toward their own truth using compassion and fun. In addition to her one-one-one coaching sessions, Deb combines her intuitive abilities and her compassion for nature to offer what she calls Wilderness Adventure Coaching. Deb maintains a practice of approximately 15 clients. 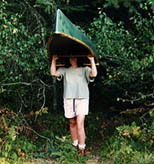 One of Deb's favorite back-country activities is portaging her canoe from one lake to another. She loves the discovery process. "The portage itself is as much fun as getting to the next lake." Thus, Deb believes any transition must be driven by a value that reflects the core of who you are. "When you get to the who, the what and the how happen naturally. Once you've set your sights on an outcome, hold it very, very lightly and focus on the process instead. Gratitude for the process may take you down a path you can't yet envision and leave you much more open to the insights that will come your way." Deb says you can still make plans. But be curious and leave space for surprises. "Intuition is blocked when we practice traditional either/or thinking as we set goals. The surprises and insights you leave space for will perhaps move you away from the original goal but can lead you to something much richer." Deb believes that we can all significantly simplify our lives. She says that many clients come to her wanting to do something, in order to have something, in order to be somebody. Deb says, "Be somebody first and the doing and having are natural outcomes. The more you discover your truth about who you are, the more you'll get what you really want." Deb's Vision: An adventurous world in which we are all connected with and support nature while enjoying our deepest desires. Deb's Mission: To help you discover what it is you deeply desire and easily live a life of adventures that fulfill and energize you.